The UT Institute for Public Service (IPS) has tapped Clinton Police Chief Rick Scarbrough to serve as the next executive director for its Law Enforcement Innovation Center (LEIC). Scarbrough will succeed LEIC’s current director Don Green, who is retiring July 31 after 10 years with the center. “Rick not only has strong law enforcement ties throughout the state, he’s also very familiar with LEIC and its training having served as an instructor for the last three years,” said IPS Vice President Herb Byrd III. Scarbrough, who will start with LEIC on August 1, has served as Clinton’s police chief since 2002. He’s worked with the city of Clinton since 1995 when he started as a community education officer. Since 2015, he’s served part-time as an instructor for several LEIC classes including STOP Domestic Violence awareness training, capital budgeting, leadership and community policing. 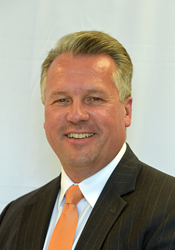 He received his bachelor’s and master’s degrees in organizational management from Tusculum College. Scarbrough said he is eager to get started full-time with LEIC and is looking forward to this opportunity with UT. LEIC, one of six agencies in the IPS organization, provides training for the law enforcement community across the nation. The center offers the National Forensic Academy and the Southeastern Leadership Academy as well as individual courses on forensic investigation, school safety, response to an active shooter and officer decision making.